Rural education in China has seen major improvements and has gained measurably when it comes to facilities, equipment and teacher quality, the Ministry of Education said on Tuesday. The country has invested heavily in improving the infrastructure of rural schools and attracting more teachers by offering better salaries, officials said at a news conference. Hu Yanpin, an inspector from the ministry's office of national education inspection, said central and local governments invested 542.6 billion yuan ($81 billion) from 2013 to 2018 in building and renovating school buildings and buying teaching tools. To bridge the gap between urban and rural education resources, different levels of governments purchased 5.1 million computers. 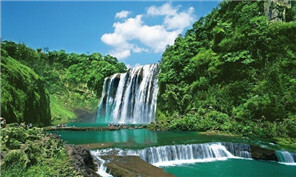 And more than 90 percent of primary and secondary schools in China now have access to the internet, he said. "The ministry will continue to support rural teachers, by increasing their salaries and encouraging more college graduates to work at rural primary and middle schools," he said. "More educational resources will be allocated to poverty-stricken areas, with the goal that no child in China will be prevented from attending school because of poverty." Liu Jiantong, an inspector in the ministry's department of teacher education, said 335,000 college graduates have been hired to work at rural schools in central and western China since 2006, adding that the country now has 2.9 million rural teachers, 1.7 million of whom are under 40 years old. 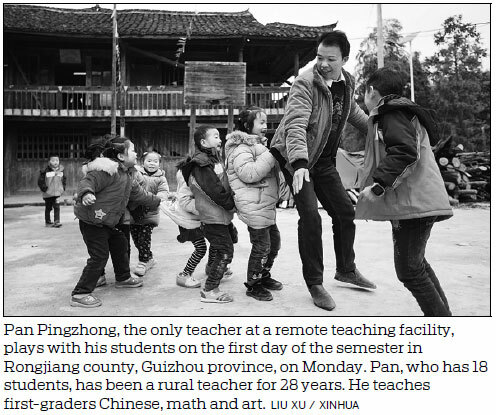 The central government has allocated 15.7 billion yuan since 2013 for subsidies to 1.27 million rural teachers, with some teachers receiving 2,000 yuan per month, he said. Local governments in eight provinces and municipalities have provided more than 6.2 billion yuan of subsidies to 688,000 rural teachers. Zhi Yueying, who has spent more than 38 years educating children in the remote villages of Jiangxi province, said the facilities at her school have improved greatly and it's the most beautiful building in her village. "Improved living conditions have also attracted more teachers to rural areas," she said. Chen Liqun, president of Minzu Middle School in Guizhou province's Taijiang county, said the improvements in school conditions have induced many dropouts to return. The parents of many students at Minzu have left home to work in cities and have left their children behind with grandparents who sometimes don't have enough energy to take care of them, Chen said. To better manage the students and reduce the dropout rate, all students now live in school dormitories, he said. "The most sustainable way to keep rural students out of poverty is to give them a good education, and I am willing to offer my help," Chen said.